Blue Horizon Resort, Mudjin Harbour, Middle Caicos. La Dolce Vita on Hollywood Beach, North Caicos. 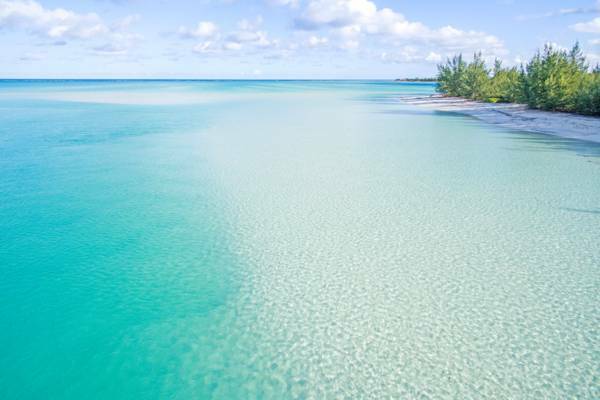 The tranquil islands of North Caicos and Middle Caicos offer a quiet and laid-back atmosphere that’s becoming all too uncommon in the Caribbean. Found in the centre of the Turks and Caicos archipelago, these two islands are the perfect destination for deserted white sand beaches and natural sights. The accommodation choices on North Caicos and Middle Caicos are a bit more limited compared to the offerings on Providenciales. The Pelican Beach Hotel on North Caicos and Dragon Cay Resort on Middle Caicos are the only hotels/resorts. The majority of lodgings across both islands are vacation rental villas and suites. The islands have low levels of development, and most rental accommodations are found in the settlements of Whitby, Bottle Creek, Sandy Point or Kew on North Caicos, or in Conch Bar or Bambarra on Middle Caicos. With the exception of the village of Bottle Creek and Kew, most accommodations on both islands are either located on the beach or are within close walking distance of the beach. Some of the natural and historical attractions may be a bit remote, and shops, restaurants and sights tend to be spread across both islands, so we recommend that visitors rent a vehicle for at least part of their stay. Complementary amenities such as bicycles, kayaks, stand up paddle boards and snorkel gear are often included at many of the vacation rentals, but if it’s important that you have the use of any equipment, ensure that it’s available before booking. Providenciales has a decent selection of water sports and outdoor shops that sell beach toys, umbrellas, snorkel gear and more. The Mudjin Harbour coastline on Middle Caicos. You should considering stocking up on food and supplies on Providenciales before travelling over to North Caicos and Middle Caicos. The small supermarkets on North Caicos actually have good prices, but selection can be limited, especially for meat, dairy, and gourmet products. In the majority of cases, you’ll get the best rates by contacting the hotel or villa manager directly. You should definitely do a little research online beforehand so as to have an idea of the going price. As is also the case on Providenciales, location plays a large part in room rates. Villa rentals that are beachfront on coasts such as Mudjin Harbour, Whitby Beach, Bambarra Beach, Hollywood Beach, and Horsestable Beach command much higher rates than rooms in the settlements of Kew and inland Bottle Creek. Rental vehicles are expensive (and in our opinion necessary), and some accommodations offer package rental car deals. Such a deal can save you quite a bit. What Island Should You Stay On? 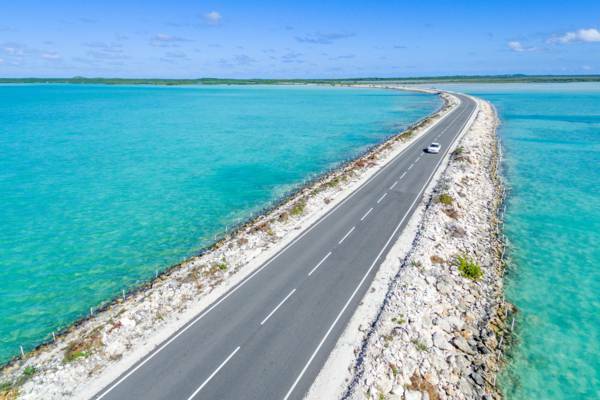 North and Middle Caicos are connected by a driveable causeway, so it doesn’t really make a huge difference. North Caicos does have the better selection of shops and restaurants, but Middle Caicos offers a bit more in terms of sights and beaches. Many beachfront vacation villas on North Caicos are located in the settlement of Whitby. Vacation house rentals are the primary accommodation choices on both islands. Keeping with the laid-back atmosphere, there are no Middle Caicos hotels, and only the small Pelican Beach Hotel on North Caicos. It takes about 25-40 minutes to drive from the central region of Middle Caicos to the supermarkets and gas stations on North Caicos. This 10-20 mile (16-32km) journey is almost entirely on paved roads. If you’re looking for breath-taking and expansive views from you lodging, the locations of Mudjin Harbour or Bottle Creek should be considered. If you’d prefer the spa, dining and concierge services and amenities of a luxury resort, one of our boutique islands may be a better choice for your vacation. Such options include the COMO Parrot Cay Resort on Parrot Cay, and the Meridian Club on Pine Cay. A road causeway connects North Caicos and Middle Caicos. 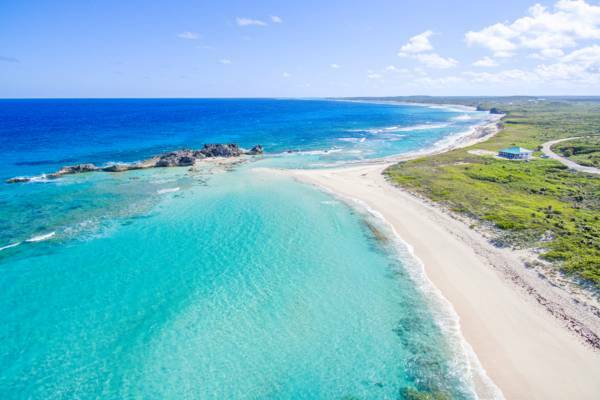 No international flights land at North Caicos or Middle Caicos, so you’ll have to make the final connection from Providenciales to North Caicos by ferry or charter flight. The passenger ferry (not suitable for cars) travels the route several times per day, and departs from the Heaving Down Rock Marina on Providenciales, which is east of the Grace Bay Beach region. Ferries land at one of two locations on North Caicos, Sandy Point Marina, or Bellefield Landing. There are no scheduled domestic flights to either North Caicos or Middle Caicos. Both of our local airlines, interCaribbean and Caicos Express Airways, offer charter flights. Be aware that smaller turbo-prop aircraft are used for island hopping routes, and there may be luggage restrictions. Inquire before you book. The North Caicos Airport (NCA) is located near Major Hill and Bottle Creek, and the Middle Caicos Airport is found near the village of Conch Bar and not far from Mudjin Harbour. We highly advise that guests rent a car for the duration of their stay, as there is no public transport and taxis are scarce. Many beaches and natural sights tend to be a bit isolated, so having a rental car will give you the freedom to explore the best of the islands. Accommodation check in times normally coincide with the arrival times of your ferry or flight, and your property manager will usually meet your party when you land. North and Middle Caicos experience the greatest amount of rainfall of the islands in the Turks and Caicos, and as such do see large numbers of mosquitoes at times. Generally, the emergence of mosquitoes coincides with the Atlantic hurricane season due to rainfall caused by passing tropical depressions. Wind typically disperses mosquitoes quickly, but the best time to visit is typically the winter months. The Sandy Point area, including the marina where the passenger ferry to Providenciales docks, can have biting midges (commonly referred to as no see ums or sand fleas) in the morning and evening. Mosquitoes repellents and precautions are appropriate for these pests. Sandy Point Beach on North Caicos. There are several excellent restaurants across North Caicos and Middle Caicos. The truth is that some of the best Turks and Caicos cuisine is found on our Garden Islands. You’ll definitely notice the difference in the national favourite dish of poached fish, peas and rice. On North and Middle, the fish is freshly-caught and the vegetables are locally-grown. On Providenciales, the chances are that the ingredients are imported. Many of the vacation rental villas and suites offer full kitchens for those who’d like to cook. A few small grocery stores are found on North Caicos. Prices are generally low, yet the selection of specialty items may be quite limited. If you’re planning to cook while staying on North or Middle Caicos, visiting one of the extensive Providenciales grocery stores before island hopping to North Caicos. We advise using a cooler to transport perishables. The Building Materials Do It Center (Providenciales) on Providenciales is the best place to check for coolers, umbrellas, and other outdoor vacation essentials. The catch always varies, yet it’s easy to find fresh snapper and grouper for sale, and, when in season, conch and lobster. The vast majority of farming in the Turks and Caicos takes place on North Caicos, so you’ll also be able to find fresh tomatoes, lettuce, papaya, plantains, squash, peppers and flavourful key limes. There is a 12% tax on top of all rates. A/C is not always included in the price and may be extra. There may be additional charges or fees. This villa offers three separate two bedroom one bath rental units on the peaceful Whitby Beach on North Caicos. Amenities include a BBQ grill, gazebo, complimentary bicycle usage, Wi-Fi, a fully equipped kitchen, washer and dryer, and more. The Dragon Cay Resort is located at the majestic Mudjin Harbour on Middle Caicos. These villa-style accommodations combine seclusion, comfort, and unrivalled vistas. 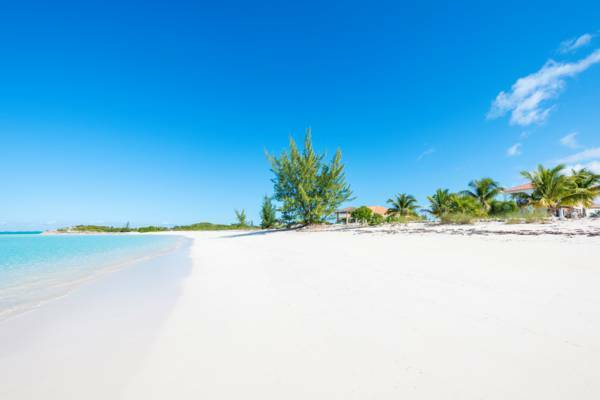 Empyrean Villas are found in the tranquil settlement of Whitby on North Caicos. These two bedroom and two bathroom cottages are a short walk from the white sands and turquoise water of Whitby Beach, and have a convenient selection of indoor and outdoor amenities. Hollywood Beach Suites is a secluded intimate and tranquil paradise on the Island of North Caicos. Four comfortable beachfront suites sit directly on a stunning seven-mile stretch of sparkling white, powder-soft sand and look out on brilliant sweeping turquoise waters. Complementary snorkelling, kayaking, biking, high-speed Internet connection. 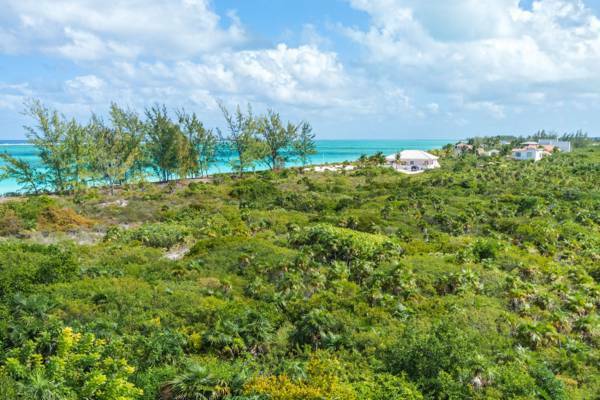 This two bedroom villa is located at the quiet Bambarra Beach on Middle Caicos. 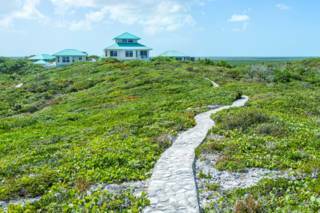 This beachfront villa is located on the quiet Whitby Beach on North Caicos. Amenities include a full kitchen and complementary kayak and bicycle use. Two bedroom, one bathroom duplex home located just across from the beach.